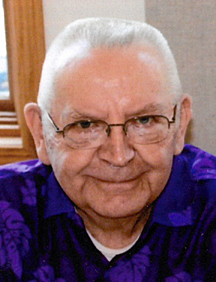 Earl Rudolph Tumberg was born on April 3, 1942 at Wesley Hospital in Wadena, Minnesota. His parents were the late Hjalmer and Ida (Fiskari) Tumberg. Earl graduated from the New York Mills High School with the class of 1960. On March 27, 1971 Earl was united in marriage with Julia Elizabeth Aho at Spruce Grove Apostolic Lutheran Church in Wolf Lake, Minnesota. Their marriage was blessed with six children. Earl and Julia raised their family and farmed in Deer Creek Township. In 1986 Earl retired from farming. He was employed with Perham Farm Supply and then at the Elders’ Home in New York Mills, retiring in 2007. Earl had a sparkling personality; friendly and comical, his laughter was contagious and extremely unique; he always had a smile and kind word to share with everyone he met. He enjoyed NTPA tractor pulls (IH red was his favorite); traveling to and watching pulls with family and friends. He also liked watching local and college sports, wresting and basketball, and the Minnesota Vikings. Finally, Earl often took time out to travel to see family and attend their special and milestone events. On February 12, 2019 Earl passed away peacefully surrounded by his loving family at St. Cloud Hospital at 76 years of age. He will be dearly missed by his family and friends. Preceding Earl in death were his parents, Hjalmer and Ida; siblings: Evelyn (Al) Tervo, Howard, Arnold (Pat), Morris, Esther, Robert and Gordon; grandchildren: Raina and Radley. Earl is survived by his wife, Julia Tumberg; daughters: Rachael (Eric) Hodgson; Roberta Tumberg; ReNelle Tumberg; Riika (Trent) Gropper; sons: Ryan (Deb) Tumberg and Reece (Ronda) Tumberg; 18 grandchildren; 2 great-grandchildren; sister, Helen (Martin) Mursu; brothers: Clifford (Anne) Tumberg; Andy (Janet) Tumberg and Jimmy (Nancy) Tumberg; brothers-in-law: John (Mary) Aho, Arvi (JoAnne) Aho and Victor (Lola) Aho; sister-in-law, Maria (Larry) Kinnunen; numerous nieces, nephews, cousins, other relatives and a host of friends. Family and friends are encouraged to wear International Harvester apparel to the visitation.